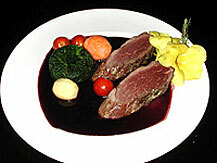 The Ristorante Amarone is a genuine Italian restaurant in Cabo San Lucas, Mexico. The chef is Italian from Bardolino, a small town on the west coast of Garda Lake, near Verona and the menu is typically northern Italian. 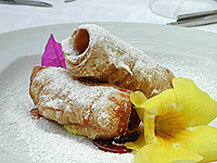 All pastas are hand-made as well as bread and all desserts. Many products used here are imported from Italy such as Parmigiano Reggiano cheese, Prosciutto di Parma, Mascarpone cheese, Balsamic vinegar añejo, Cafe, Pellini, Colavita extra virgin olive oil, Mozzarella di bufala cheese and many wines, especially the Amarone. A wide variety of Italian style aperitifs and cocktails (Martini and Campari based) are served here and is suggested having them on the terrace facing the best part of the Cabo San Lucas marina. Emperor Augustus had a favorite wine: the "Retico". Teodoricus, the great warrior grown-up at the Constantinople's court, expert in Greek and Mediterranean wines, was very fond of the "Acinatico"; this wine was described in its production techniques, especially the withering of grapes, by Teodoricus's minister Cassiodorus, and this technique has been the same for the last 15 centuries. 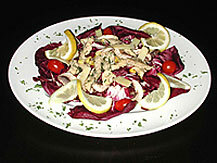 From "Acinatico" comes the "Amarone", a unique wine. The vine that give grapes used to produce "Amarone" are cultivated only in the green hills surrounding the city of Verona, Italy. The name of our restaurant is a tribute to this great wine, and to the traditional cuisine of our city, which uses "Amarone" in many recepies, as a perfect match with the typical flavours: grilled red meat, lamb, braised beef and mature cheese. Nevertheless, the extraordinary concentration of the cherry and raspberry flavour, as well as the more delicate of raisins and spices, allow "Amarone" to create an original and fascinating combination with many other dishes. A unique and noble wine. The wine that gives grapes to produce "Amarone" are cultivated only in the green hills surrounding the city of Verona, Italy. The production techniques of this wine, from the withering of the grapes, the pruning, the fermentation, the squeeze, and finally to the ageing, are not used in any other place of the world. Its fragrance and flavour are strong, complex and delicious. "Amarone" is a wine filled with sensations. Its colour is a velvet and intense ruby.